Famous as the “Oxford of the East” and as “City of virtuous deeds”, Pune is one of the fastest growing cities in India and is a vivid educational, spiritual and cultural hub. Its rich history attracts hordes of travellers every year, who throng to experience the birthplace of the majestic Maratha leader Chhatrapati Shivaji. The question is, where in Pune can you find a comfortable, affordable place to stay? Whether you want to unwind in luxury or laze on a budget Pune has the perfect neighborhood for every traveller! Listed below are the top 4 places that you can consider staying at while visiting the city. These places are well connected, are not too shabby and have some of the best Pune Hotels located in there. This is the prime neighbourhood of Pune, and sparkling with high-end restaurants, hotels, clubs, malls and spas. The world famous Osho Ashram is also located here, as well as the bungalows and apartments of the city’s rich as famous residents. Koregaon Park also buzzes with nightlife, so it is perfect if you want to paint the town red! There are several 5-Star and 4-Star hotels here. What is surprising are their inexpensive rates considering their stellar services, they offer saunas and indoor pools, concierge service and free parking. Our take: The perfect base from which you can hit the nightclubs every night. The earliest settlements in Pune centred on the original Gymkhana here, and some of the city’s oldest families have lived here for generations. If you want the Pune’s historical and cultural legacy close at hand, you should stay here. Deccan is home to the ruins of the magnificent Shaniwar Wada. The Kelkar Museum is also located here. Contributing to the fast-paced energy are the surrounding university campuses including Pune University and the prestigious Fergusson College. Deccan teems with restaurants, art galleries, quaint cafes, hip bars, theatres and movie halls. 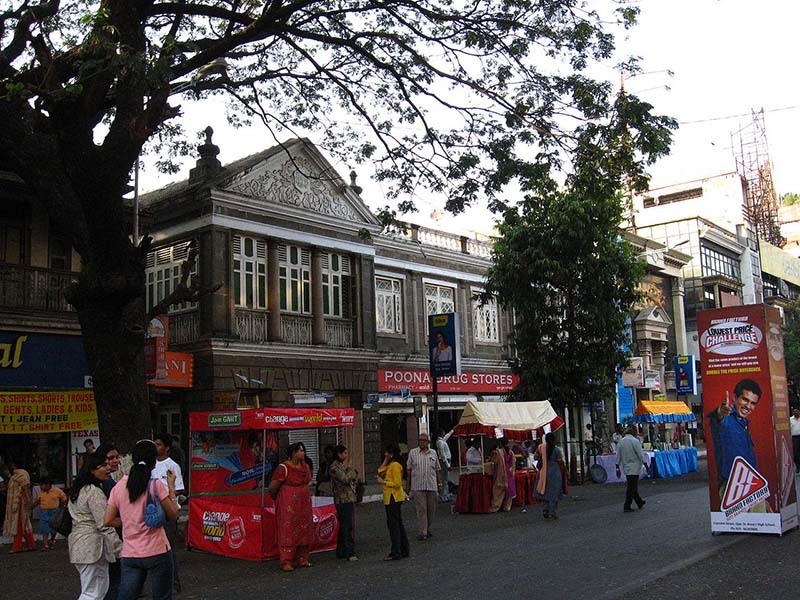 It also boasts some of Pune’s best street shopping and is the heart of the youth culture. Just beyond Deccan proper, there are a number of 3-Star hotels. Their convenient location, affordable prices, free Wi-Fi and large rooms attract tourists of every budget. A bonus is a large number of restaurants serving delectable dishes. A stark contrast from the Deccan Gymkhana neighbourhood is this bastion of military history. This was once the place where a platoon of soldiers of the British Indian army was stationed. Today, the Indian Army’s Southern Command is situated here. This area boasts a rich cosmopolitan strain and places to explore include the Racecourse, the Jewish Synagogue, and the elegant Empress Garden, War Memorials and museums, cafes, restaurants and family-owned stores. Shop to your heart’s content in the classy shops and then breathe easy in the vast open spaces of the Bund Garden. Accommodation options here range from 3-Star hotels to grander 4-Star retreats. You can hunt for a bargain here: find large comfy rooms with great amenities. Our take: Camp is located in the absolute city center so every part of the city is easily accessible from here. This neighbourhood is located pretty close to Pune’s International Airport. This area is bustling with IT companies. Also, the largest malls in Pune, Inorbit and Phoenix Marketcity are located nearby, at walking distance. As a bonus, Koregaon Park is located just a few kilometres away. You will find a large variety of 3-Star to 5-Star Pune hotels here, comfortable and affordable. Our take: Land at the airport and set up base in this lively neighbourhood. Now that we know where you can make camp in Pune while visiting, let me also list down the top visited tourist destinations in the city. Yes you read that right. Pune is not all about being a commercial center. There are several places in the city that definitely deserve a visit. 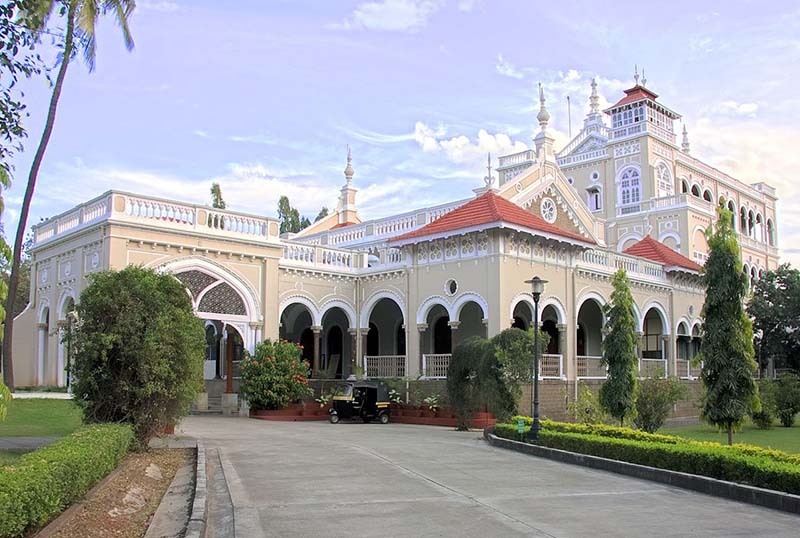 This majestic building was built by Sultan Muhammad Shah Aga Khan III in 1892 and is now considered as an important landmark not only in the city of Pune but Indian history as well. Now a popular tourist destination, this building also once served as a prison for Mahatma Gandhi during Indian freedom movement. This grand palace once served as the seat of power for Peshwa rulers of the Maratha Empire. It was built in 1732 and remained under the control of Maratha Rulers until 1818 before they finally got defeated in the battle by British East India Company. Not only an architectural wonder, it is also considered among the top most haunted sites in India. Also known as Kondhana, this hill fortress is over 2000 years old; and has seen several battles ever since it’s construction. It is located about 35 kilometers from Pune on an isolated clif at a height of 4304 ft. It is a must visit place for anyone wanting to observe the grand architecture of Maratha empire and experience the scenic beauty of the Sahyadris. So the next time you are in Pune, make sure to check out the above mentioned places for your stay. All of the 4 localities are easily accessible from train station and airports and have good Pune hotels located in them. While you are in the city, do not miss to take some time out and visit Aga Khan Palace and the forts of Shaniwar Wada and Sinhagad. Some other places you can visit, depending on the number of days you have in hand, are Shivneri Fort, Lal Mahal, The Empress Garden, Rajgadh Fort, Chaturshringi Temple and Pataleshwar. I hope the information above was of help. If you have any questions please feel free to ask in the comments sections below and I will be happy to answer.